You’re very welcome, sir, and thank you for all the kind words! It is good to know that even an accomplished aquarist and experienced seahorse keeper like yourself finds the training course to be useful and informative. It sounds like you handled the situation at your LFS very nicely, Scott. I’m glad to hear that the staff at the fish store are now aware that there is a place for hobbyists to go in order to learn all about the care and keeping of seahorses before they take the plunge, and it’s great that the three extra seahorses have now found a home with dedicated, conscientious aquarists. Well done! Best wishes with all your fishes, Scott! Keep up the great work! hi i would like to join the training program. i’d been keeping saltwater aquarium for the last 4 yrs now i know the basic about keeping saltwater fishes and corals in captivity, but i wanna upgrade on keeping seahorses. i have two right now i live here in hawaii in the big island i’ve been in you guy’s seahorse farm i really wanna learn more about seahorses. thanks it’s just to bad you guy’s don’t sell here in the big island… but yes i understand why and respect that as a hobbies myself… so plz inroll me on seahorse training program. my name is fred i have called you guy’s there before asking about selling me a seahorse..LOL! anyways my email is [email protected]..
you guy’s website help so much! Yes, sir, you’re quite correct — Ocean Rider (seahorse.com) does have a strict policy against selling any of their livestock within the State of Hawaii. This limitation is necessary to prevent the accidental or intentional release of seahorses that are not native to the islands into Hawaiian waters where they may have a negative impact on endemic seahorses and ecosystems. The release of captive specimens is widely acknowledged to have the potential to do considerable harm under certain circumstances. The primary concerns are that such releases could introduce diseases into seahorse populations, could pose genetic threats to wild populations, and could disrupt the structure and normal function of seahorse communities, and may therefore actually result in extirpations (localized extinctions) of native seahorses. I’m glad that you can understand the rationale behind Ocean Rider’s policy in that regard, Fred. 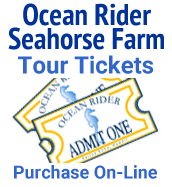 However, the fact that Ocean Rider cannot provide livestock for you will have no effect whatsoever on the training lessons since you do not have to have Ocean Rider seahorses, or seahorses of any kind, in order to participate in the training course. In short, Fred, I would be happy to enroll you in the Ocean Rider seahorse training program and I will get you started off with the first lesson immediately. Look for in your inbox later today, sir. In the meantime, Fred, I will be very grateful if you could send me a brief reply to this message that includes your full name (first and last), which I need for my records. And it will also help me to provide you with the best possible guidance if you can tell me a little more about the marine aquariums that you are currently keeping, especially if one of them will be serving as your seahorse setup. Best wishes with all your fishes (and invertebrates), Fred! Thanks for replying on my enrollment for the Seahorse Training Program… I’m, sorry for not putting my full name but here it is my full name is frederick Lazaro but can call me fred for short.about my tank right now currently have a 30 gallon reef tank, a 20 gallon just for seahorses and a new 55 gallon still cycling not ready for anykind… well let me tell you about my 20 gallon where I have my seahorses now..I’m currently using aqua clear as my biological filtration and a 20 ponds of live rocks I have put artificial corals around the rocks so my seahorses have something to hold on I have a uv sterilizer and got me a CPR bak pak protien skimmer but I think it’s to big for my tank, cause it’s giving out a lot off micro bubbles in the tank which it’s bad for seahorses.So I took it out and tommorow I’ll go to petco and buy me one of those biocube protien skimmer that i think will be better.i do 20 percent water change every sunday, I did it that way so I won’t for get it… and I do regular test for my water.And my seahorses are doing good I had them for about 3 months now and they look really happy, but I think they’re bought female,hoping to find a male someday,And Wishing to keep my babies for a long time with you guy’s help. Ounce again thank you so much. Thank you for getting back to me with your full name and the additional information regarding your current aquarium systems. I’m glad to hear that your seahorses have been doing so well and completing the training course will help assure that they remain healthy and happy. I have a CPR bak pak and you can make a silencer to reduce the noise. Also, when a protein skimmer is new, it often makes bubbles. As per CPR’s instructions you should also be able to reduce noise and bubbles by lengthening the airline tubing to about 2ft. If this does not help the bubbles, CPR sells a bubble trap which you can place over the tube which pours into the tank, thus removing the bubbles. Sometimes the bubbles are caused by inadequate air flow. You can remove the mushroomlike black plastic piece from the tube which comes out of your tank into the air. To be sure the skimmer will make even more noise but you can make the silencer to help this. Take an empty film canister with a lid and drill a hole in it. You want the hole big enough to fit your airline tubung but not so big that it will fall off. Put the tubing through the hole in the bottom of the canister. take another piece of tubing very short maybe 1/4 inch to half inch and stick that into the grey film canister lid. Put the lid on the film canister with each tube inside and the small one hanging out a bit. The two pieces of tubing do not need to touch inside the canister. Voila you have increased your air flow and reduced the noise! Good luck. understand….do U put an airstone at the end of it or just leave it open? Thanks for the info on noise reduction! the vertical piece of black piping that returns water to the tank. Best of luck finding a stallion to keep your lonely female’s company, Fred! You should already have received the first three lessons in the seahorse training program, sir, and I will keep them coming regularly now that I have all of the information I need. Is it too late to join the Seahorse training program? I would love to do it. No, sir — it is never too late to sign up for the seahorse training program. The training course is an ongoing project that is always available free of charge to anyone who is interested in learning more about the care and keeping of seahorses. I received your e-mail off list, Tim, and you are now officially enrolled in the Ocean Rider seahorse training program. In fact, you should receive the first lesson by the end of the day. Best wishes with all your fishes, Tim! Good luck with the lessons, sir. I’m very interested in taking your seahorse training course. I’m brand new to keeping aquariums. I have a 14 gallon biocube that is dedicated to seahorses of which I have two. I also have a pipefish and several clean-up crew. Recently, I lost one of my seahorses. I don’t know why, he seemed to just waste away. I desperately searched the internet for help and discovered so much that I didn’t know about seahorses; I’m glad I found this site! The seahorse training program is a very comprehensive correspondence course conducted entirely via e-mail, so I need to have your e-mail address in order to assure that you receive the lessons, Deborah. As soon as I receive your e-mail, I will send you a reply, and we will get started on the lessons immediately. Best wishes with all your fishes, Deborah! Okay, it did indeed receive your e-mail off list and I have enrolled you in the free Ocean Rider seahorse training program. By now, you should already have received the first lessons. Best of luck with the training course, Deborah! I am looking into starting a saltwater tank. I would be a beginner. My sole purpose for wanting a saltwater tank is to get seahorses. I am an avid seahorse lover. I would love to enroll in the seahorse course, if someone could direct me as to how! I want to make sure I do everything right. Glad to see there are many passionate people out there for seahorses. Thanks in advance for any guidance. I would be very happy to enroll you in the Ocean Rider seahorse training program, but I will need to know your full name (first and last) for my records in order to do so. It doesn’t matter if you’re a beginner or if this will be your first saltwater aquarium, Sarah. The training course is very comprehensive and is designed to teach you the fundamentals of good aquarium keeping as you go along. After you’ve had a chance to read over each lesson and digest the information thoroughly, I will answer any remaining questions or concerns you may have until everything is perfectly clear to you, and I will be working with you personally in this way until your new aquarium is up and running, ready to receive your first seahorses. The lessons will teach you everything you need to know about the care and keeping of seahorses and how to establish your aquarium to create ideal conditions for the ponies. Please contact me off list ([email protected]) at your earliest convenience, Sarah, and we’ll get started right away. Best wishes with all your fishes! Completing the Ocean Rider seahorse training program is the best possible research you can do on the care and keeping of seahorses, and I will be happy to enroll you in the training course and walk you through each of the lessons until you feel you are ready to take the plunge and set up a home aquarium devoted to seahorses. As you know, the seahorse training program is completely free of charge and is extremely comprehensive. It will explain how to select a suitable aquarium and optimize it for seahorses in far greater detail than we can possibly manage on a simple discussion forum such as this. The Ocean Rider seahorse training program is a correspondence course that is conducted entirely via e-mail, Lee, so I need you to contact me off list ([email protected]) with a very brief message before we can get started. I will then respond to your e-mail, and once we have opened the lines of communication and established contact via e-mail, I will begin sending you the lessons and answering any and all questions you may have after you’ve had a chance to go over each of the installments. The correspondence course is designed to teach you the basics of good aquarium keeping as you go along, Lee, and I will be working with you personally via e-mail every step of the way until you are ready to tackle your first seahorses with confidence. Best wishes with all your fishes, Lee!